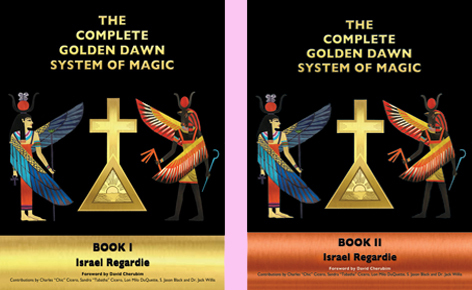 The Complete Golden Dawn System of Magic was Israel Regardie's last book, the final token of his True Will. Through this book he bequeathed to us the means to carry on the Great work o the Golden Dawn which, in a nutshell, is Initiation. This is the master compilation of the magical teachings of the Hermetic Order of the Golden Dawn of which Israel Regardie was an initiated Adept. The material in this book is a highly improved version of the ground breaking material in the four-volume set by Dr. Regardie that revolutionized the Occult world in the late 1930s. It includes the Order's instructions in Ritual Magic, Invocation, Tarot, Qabalah, Enochian, Astrology, Esoteric Doctrine and more, along with the Order's Initiation Rituals. Read more and order the book here.